NHRA Top Fuel driver, Leah Pritchett, has just confirmed that she will be competing at the 7th Annual NHRA 4-Wide Nationals in Charlotte, NC. She will take the seat driving the Nitro Ninja Top Fuel dragster owned by the Lagana family with backing from primary sponsor FireAde 2000. Pritchett and her entire Bob Vandergriff Racing team were recently released after a retirement announcement by owner Bob Vandergriff, Jr. This left the recent event winning Top Fuel driver scrambling once again as a free-agent to continue her driving career in the NHRA Mello Yello Drag Racing Series. Since the surprise announcement last Monday, Pritchett was able to coordinate a joint effort between her primary sponsor in FireAde 2000 and longtime partners Bonifante Friction, Aerodine Composites, and her friends in the Lagana family. Prtichett racing in Charlotte is, for now, a one-race commitment allowing Leah to continue accruing points, and maintaining visibility on the circuit while searching for a long-term opportunity. FireAde 2000 joined Pritchett at the beginning of the season as a multi-race sponsor on her BVR dragster for 2016. 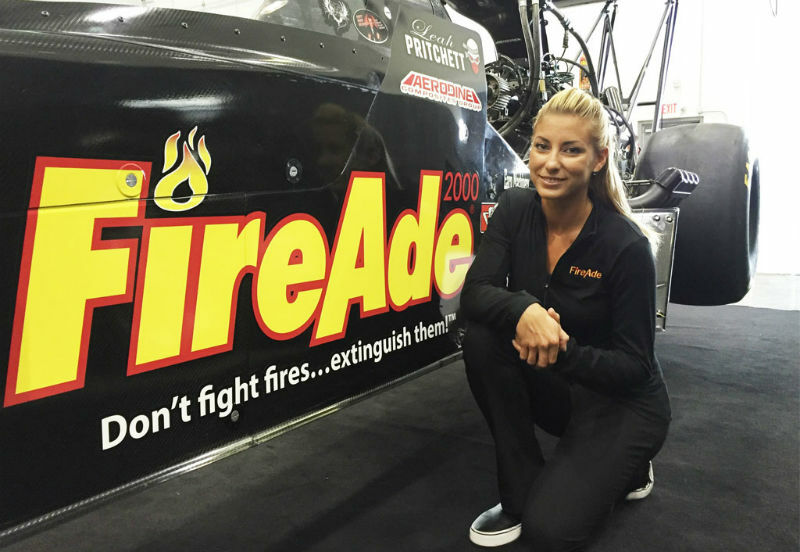 Although her run there ended prematurely, the fire safety company has stepped up to support Leah at the 4-Wide Nationals event with the Lagana team. Ron Thames, CEO and Founder of FireAde is also excited about this weekend stating, “In a short time Leah has proved to be an incredible ambassador for our company, on and off the track, and we are pleased to be able to continue our partnership with her and support her efforts during this time”. Pritchett is grateful for the opportunity, and welcomes being surrounded by friends in the Lagana family and even a few of her former crew members at BVR. Ironically, she will be driving the same dragster she competed against just a few weeks ago at the Gatornationals, driven by rookie Tripp Tatum. The Nitro Ninja dragster runs on a limited schedule, but are always competitive, headed by crew chief John Stewart. Qualifying sessions for the 7th Annual NHRA 4-Wide Nationals presented by Lowes Food begin on Friday at 4:30PM and 7:30PM EST. Television coverage will be on FOX Sports 1 with qualifying coverage on Saturday at 10 PM and eliminations Sunday at 4:30 PM EST.